At the Point of Gesture opened at the Lion and Lamb Gallery on 23 February 2013 and runs until 23 March: curated by David Ryan it’s a show of abstract paintings and a video, by five artists Clem Crosby, Gabriel Hartley, Andrea Medjesi-Jones, David Ryan and Alaena Turner , each in their different ways exploring the potential of gesture, materiality and improvisation. Maybe the exhibition title suggests that the works are only just at the point of gesture, like the Andrea Madjesi-Jones painting, where gesture seems to be included in a wider pictorial strategy, or perhaps that they have arrived at the point of gesture having set out from some other place, Clem Crosby’s work, for example, coming out of the monochrome tradition to a reconsideration of the role of drawing. 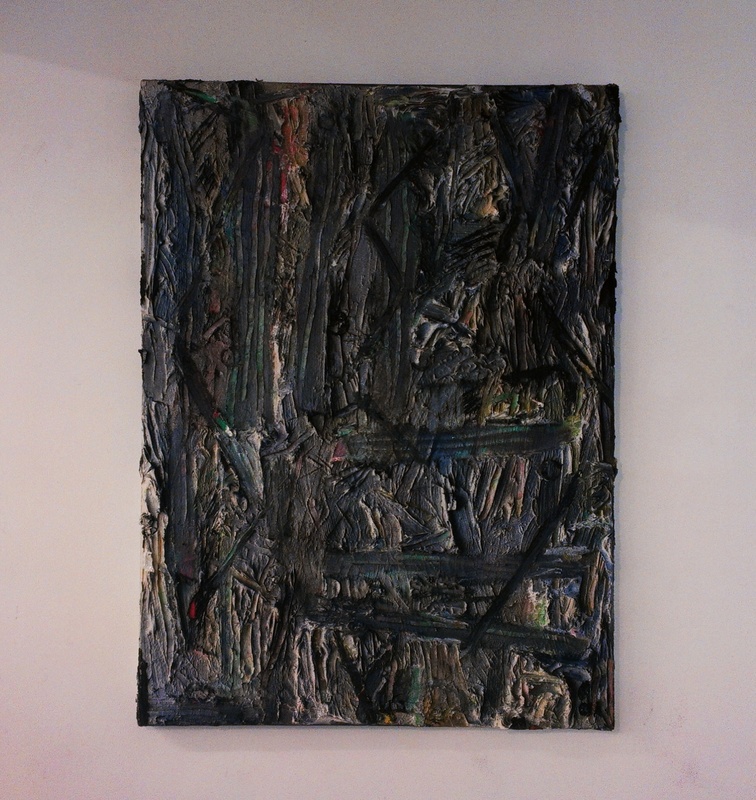 Then again, in Aleana Turner’s Secret Action Painting 3 gesture is as much implied as it is physically present. A point could almost be the opposite of a gesture, I’m thinking of pointillism where all those dots of colour negate the action of the sweeping brush stroke, yet once the dots are aggregated gestures of a sort do start to emerge. 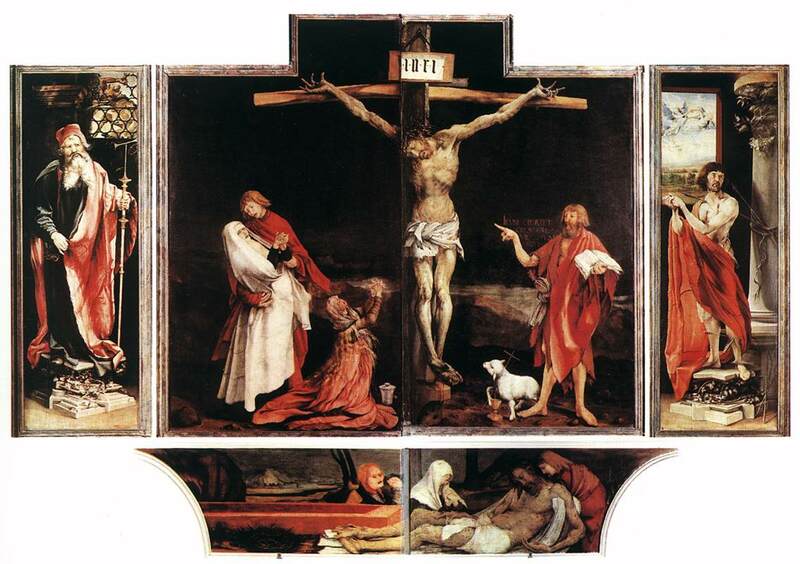 In physiological communication, to point is to gesture, and now I have in mind Grunwald’s amazing Isenhheim altarpiece where John the Baptist points at the crucified Jesus. Here the gesture refers to another, and I wonder if that might also be the case with gesture in abstract (non referential) painting, the minimum reference being to the act of painting itself, surely one of the points of the current Painting After Performance show at Tate modern. Gabriel Hartley’s spray paint over impasto brushwork seems somehow to simultaneously both dissolve and emphasise the gestural mark-making, such contradictions being possible in a painting, even if nowhere else. Approaching action painting, the individual marks almost lose themselves in the one gesture that is the finished piece. Kelp is almost white and Frack is almost black, and it’s difficult not to read them as monochromes, even though that tradition usually implies the repudiation of the gestural. 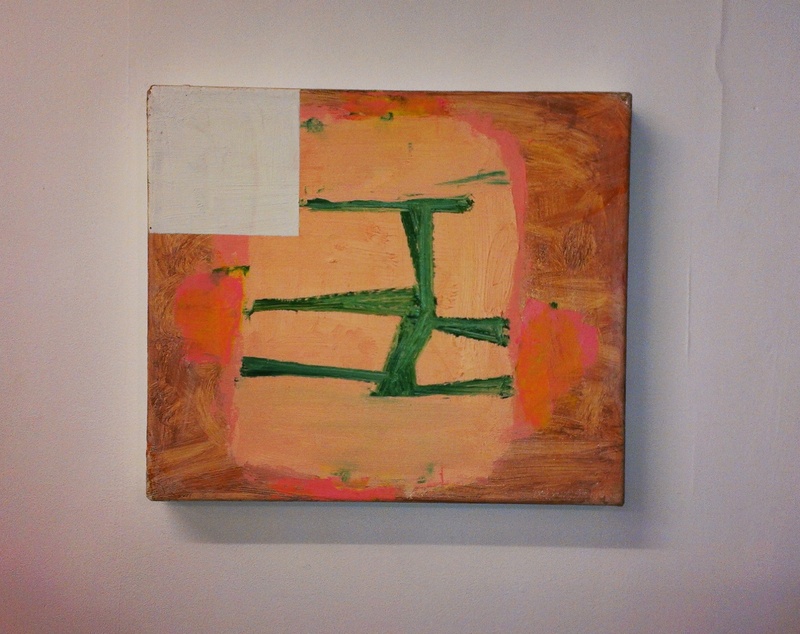 David Ryan’s Fame in California/1964, a small canvas in orange and pink has a central ‘sculptural’ figure flanked by indistinct forms or brushmarks and overlayed (or wrapped around) with a roughly painted green motif. 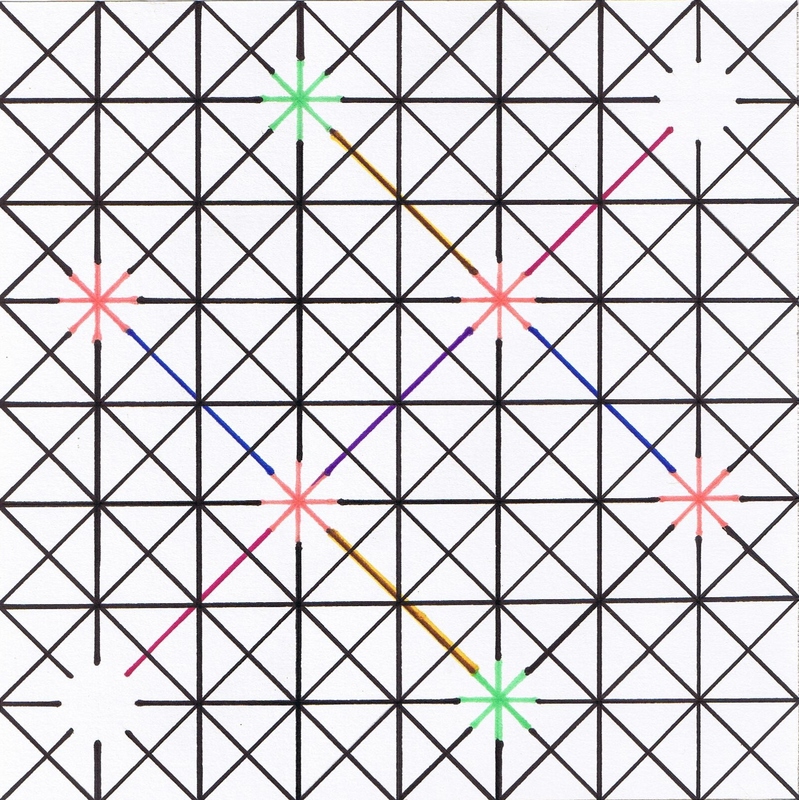 In the top left hand corner a flat white rectangle asserts the painting’s edge, against which the rest of the action seems to recede in a pictorial, non-perspectival space. Because it is optical, the space is ambiguous, it shifts slightly and the pink and orange brush strokes or blobs and a line that traces the edge of the figure, now appear to occupy a place somewhere in between the white rectangle up front and the main form further back. 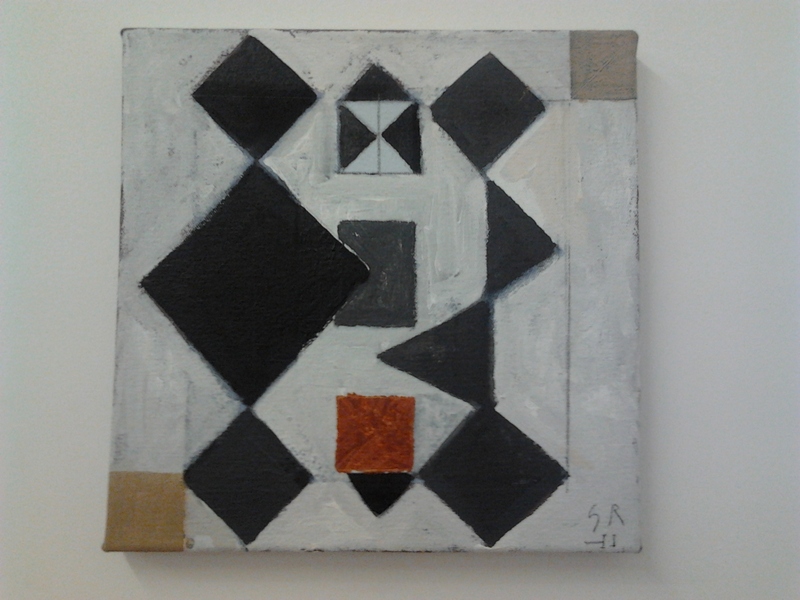 I recall that I enjoyed seeing another David Ryan painting here in the summer of 2012, a lovely little thing in black white and greys, entitled Index. It had a white rectangle in the left hand corner, similar to the one on show today. In both works this ‘hard edge’ rectangle seems incongruous, as if, there, inserted into the picture, is another very different one, a monochrome again, a painting within a painting that has me consider what other kinds of picture this one could also have become. 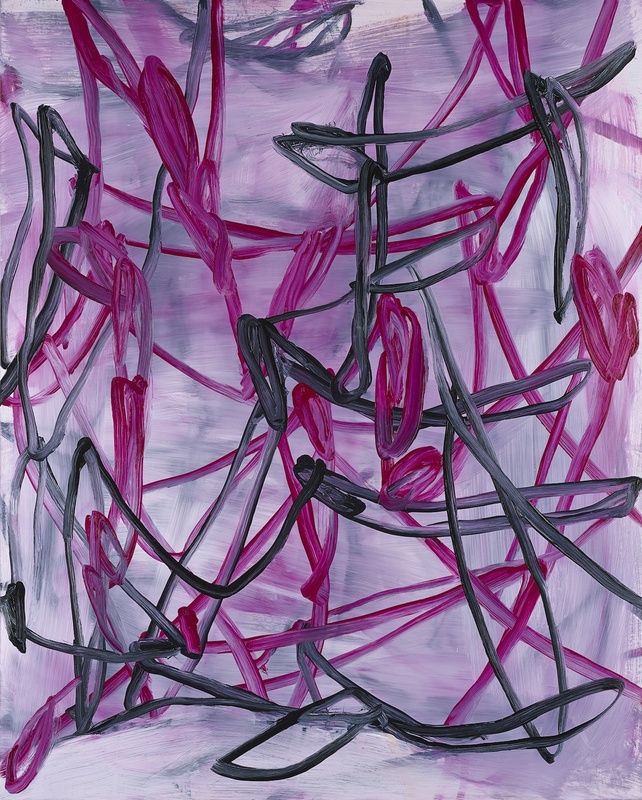 In Clem Crosby’s Little Wing, magenta and black continuous swirling lines dance on a grey ground that looks like the result of all but erased previous versions of the loose network that forms the painted ‘image’. It’s difficult not to see it as existing in a kind of landscape, the loops at the bottom of the canvas suggesting a floor upon which the lines are ‘standing’, like a sculpture of string or tape. I attempt to work out where each swirl begins and ends. In an image there is no such thing as a start and a finish yet the brush had to touch the support somewhere first and lay off somewhere too, but those entry and exit points become difficult to identify. In tracing the action with my eye and brain I also have something of the sensation of following with my hand and arm, for all I know they are actually moving, like when feeding an infant I find that I open my own mouth. So I notice that I am at the point of gesture myself, as if answering an invitation to explore the theme of the exhibition, as a viewer and also as a practitioner of abstract painting. The exhibition poses questions, for me, about the role of painterliness, offering a kind of counterpoint to my own preoccupation with systems. Here, painting is physical and the design is improvised, whereas my own practice is more cerebral and pre-planned. It’s not that a systems approach precludes chance and gesture, Kenneth Martin comes to mind as does Mel Prest whose gestural line drawings produced in a totally non-random fashion have the appearance of something random or ‘felt’, and David Ryan’s work already addresses the relationship between construction and improvisation. However, this show opens up for me some interesting questions and suggestions for future practice are starting to form. One of the stated goals of the Lion and Lamb Gallery is to provide an opportunity for painters to curate visual essays that examine current practices in painting, and for me this show delightfully succeeds in this intention. Turps Banana, Issue Twelve is out! In the early eighties Donald A. Schon, in his book The Reflective Practitioner, brought attention to the gap “between the kinds of knowledge honoured in academia and the kinds of competence valued in professional practice” and proposed an epistemology of practice he called reflection-in-action. Turps Banana Issue Twelve opens with a brief editorial in which Marcus Harvey and Peter Ashton Jones quote from Issue Nine, where Gavin Lockheart asks Peter Doig about his approach to teaching and Doig suggests that rather than teaching anyone anything we have conversations and discussions. I think what’s implied is that learning somehow takes place in what we might call reflective dialogue. It’s not teaching (not in the traditional sense anyway) but there is learning, or at least the potential for learning to take place. 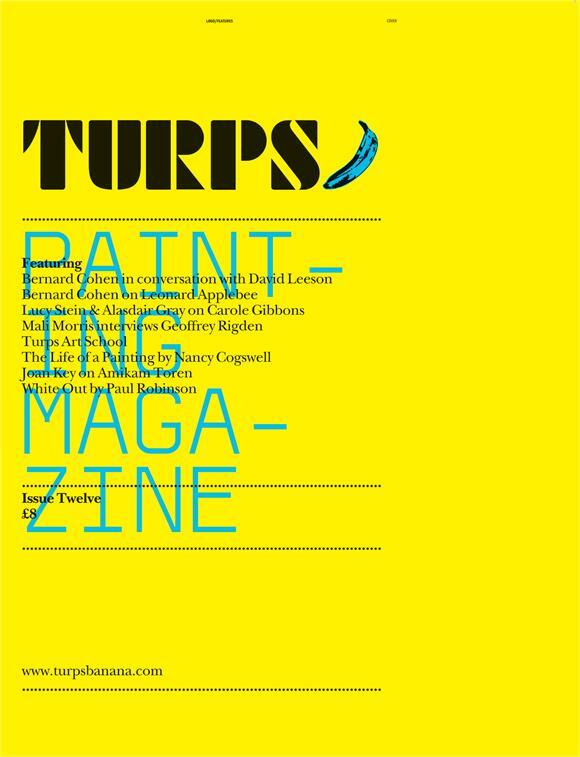 The editorial creates a frame for viewing Turps Twelve as being about the relationship between painting and learning. It occurs to me that painting is a particularly good site for reflection-in-action, a discipline in which thinking and doing are re-united (it could be argued that in a technological society the two are separated, and to such an extent as to become highly problematical). So I find the theme of learning cropping up in one way or another in each of the conversations, articles and discussions. Bernard Cohen in conversation with David Leeson, learns from paintings in the Flemish room at the National Gallery, as well as from meetings with Barnett Newman, from the danger and purity in European painting, from the paintings and writings of Paul Klee, from Kenneth Martin saying “It doesn’t matter what you paint so long as you build something”, from Rudi Wittkower at the Slade, from Pueblo pottery, Albert Camus and the Myth of Sisyphus. Then there’s a short article by Cohen on Leonard Applebee about his influence on Cohen both as a teacher and as a painter, and how the two practices of teaching and painting are interconnected. Continuing the learning theme there’s a couple of pages about the Turps Art School taking applications for the studio programme September 2013 – August 2014 and the correspondence course October 2013 – September 2014. Nancy Cogswell visits the National Gallery of Art (NGA) in Washington USA to talk with painting conservators there, and we get part-one of the interview, which ends on the nearest thing I can imagine to a cliff hanger for this type of serial, getting into some really interesting territory, asking just the questions I’d want to ask like “are there certain paintings you prefer to work on?” “Does Moholy-Nagy use masking tape to get the sharp edges on ZII ?” “How much room for manoeuvre does an individual conservator have?” “Do you think of yourselves as painters?” and “What kind of problems do you have with the colour field painters?” The interview ends with a consideration of how you learn to do something (like clean a Morris Louis) when there is no accepted way of doing it and how you gain empirical knowledge over twenty five years, surely a metaphor for painting. Whilst the acquiring of empirical knowledge is still fresh in my mind I turn the page to find that Joan Key is writing on The Empiric or Picturesque in the work of Amikam Toren. and whilst I think it likely that connections between articles may be accidental she seems to elaborate on the visual/intellectual processes of observation interpretation and judgment that were present ‘beneath the surface’ in other articles and started to become explicit in Nancy Cogswell’s interview. One of the things I like in each of the Turps Banana volumes is the way the varied conversations interconnect, almost like they are themselves conversing with each other, so that it is this process of conversation, reported and imagined, that pleasurable learning takes place for the reader, and thinking of pleasure, the pictures are great!